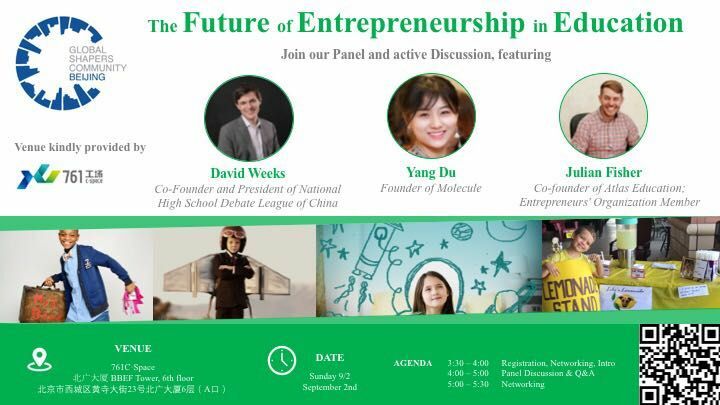 This weekend, Sep 2 (2-5pm), Beijing Global Shapers Hub II will be holding a panel and active discussion about the future of entrepreneurship in education. Entrepreneurship is a very hot topic currently in the world of learning, as startups of one kind or another seem to be popping up at breakneck speed around the world, and there aren’t many resources being allocated towards developing the programs necessary to inform about the basics of building a business from the ground up. It therefore behooves us as parents to start asking our schools how our children are being taught and encouraged to learn these skills. Can Entrepreneurship be taught? What kind of skills are needed to become an entrepreneur? This is exactly what will be covered in this talk featuring panelists Julian Fisher (Co-founder of Atlas Education), David Weeks (Co-Founder and President of National High School Debate League of China), and Yang Du (Founder of Molecule). They will dive deep into the future of education, with a focus on some successful examples of kid entrepreneurship. Make sure to bring plenty of questions for this outstanding panel of Beijing-based innovative educators. The talk will take place on the 6th floor at BBEF Tower, and the event costs RMB 30 and will cover soft drinks and snacks. Please sign up and check for more info regarding this talk on their page here.